See, the problem isn’t finding black characters in horror movies. There have been black characters in horror movies going all the way back to 1940’s “Son of Ingagi” which was the first horror movie featuring an all-black cast and written by that true pioneer of African-American film; Spencer Williams. And Mantan Moreland, best known for playing Charlie Chan’s chauffeur Birmingham Brown starred in a number of horror comedies that were more comedy than horror, but just go along with me for minute, okay? And during the Blaxploitation Era we had the “Blacula” movies, “J.D.’s Revenge” “Abby” (which actually was yanked from theaters due to Warner Brothers filing a suit against the movie, claiming it was a blatant copy of “The Exorcist.”) “Ganja & Hess” “Sugar Hill” (which is actually just as much a superhero origin movie as it is a horror movie) and “Doctor Black, Mister Hyde” as well as many, many others. As for the modern era there have been several superior horror movies featuring African-Americans such as “The People Under The Stairs” “Candyman” “Tales From The Hood” all worthy examples of the genre and well worth seeking out. So, no…black characters in horror movies aren’t hard to find. But for every one where the black character is the lead or the hero there’s a half dozen others where the black character is merely window dressing. They’re usually the best friend of the hero/heroine as a sort of visual shorthand to let the audience know that our lead character is cool and hip because they have a black BFF. Or they are simply a sacrificial lamb that gets killed off halfway through the movie. No, the problem is finding good horror movies with black characters and I’m pleased to have discovered one that has been around for a long time and that I’ve heard about but never had a chance to see until recently. CRAZY AS HELL turned out to be a real surprise for me and the longer I watched it, the more I liked the vibe I was getting from it. And while I don’t think it’s as good as “Angel Heart” or “Shutter Island” two movies it shares much in common with, CRAZY AS HELL is more than worth your time. Superstar pop psychiatrist Ty Adams (Michael Beach) reports to his new job at Sedah State Mental Hospital. Adams is going to be put in charge of the facility for thirty days while a documentary crew records everything he does in his private time and in his therapy sessions with his patients. The head of the documentary crew, Parker (John C. McGinley) assures Adams of complete co-operation but it soon becomes apparent that Parker is deliberately filming encounters Adams has with the staff and patients that don’t exactly put him in a flattering or even professional light. And the faculty’s administrator, Dr. Delazo (Ronny Cox) doesn’t trust Adams or his methods as Adams believes in totally medication free treatment for his patients. Delazo also quiet accurately puts his finger on the fact that Adams is arrogantly overconfident with a rampaging ego that will not permit him to admit when he is wrong or admit defeat. None of these traits being exactly desirable in a man who is supposed to be putting his patients first. And as if that wasn’t enough, Adams is given a new patient to treat. One who checked himself into the ha-hacienda voluntarily and insists on Adams being his doctor. The patient (Eriq La Salle) claims his name is Satan and his profession is The Father of Lies. Naturally Adams thinks he’s fulla felgercarb. But the more time he spends with Satan, the less certain he is about him. Satan knows things about Adams and the other patients that it isn’t possible for him to know. And is just a coincidence that at the same time Satan appears at the nuthouse, Adams begins to hallucinate about his wife and daughter? The same wife and daughter he refuses to talk about? Could it be that the wife and daughter are connected with “incident” in New York Dr. Delazo makes cryptic reference’s to? 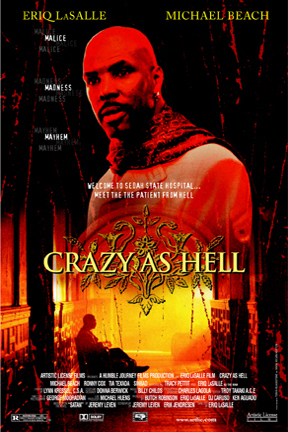 The fun of watching CRAZY AS HELL is mostly in us, along with Dr. Adams is trying to figure out if this crazy guy is actually Satan or a just a really perceptive and smart guy playing a game with Adams. And for every piece of evidence that Adams finds that says he’s actually The Devil, there’s another piece that says he isn’t. It’s a movie that maintains that suspense right up until the end and there are not a lot of movies of this type I can say it about. It truly did keep me guessing. Eriq La Salle effortlessly steals the movie both as an actor and as a director. He plays Satan with a scary seductiveness that walks a fine line between being funny and frightening. He finds the exact right note to play this character and never makes a wrong step. His direction his sharp, tight and keeps the story movie along at an even clip and again, he walks a fine line in keeping our interest while not letting us get too far ahead of Adams. He’ll drop us just enough to make us think we know more than Adams and then by the time we get to the end credits we realize we didn’t know a thing more than what he wanted us to know. Ronny Cox supplies more than able backup here and Sinbad shows up as a hospital orderly who is constantly getting the high hat from Adams. And keep your eyes open for Tia Texada who plays Lupa, who works in the facility’s cafeteria. She has a small role but Moly Hoses, does she make the most of her short screen time. Trust me when I say that if you see the movie you’ll know exactly what I mean. So should you see CRAZY AS HELL? Absolutely. It’s a terrific example of a type of horror filmmaking that doesn’t need buckets of blood, pornographic violence or fake out jump scares to do its job. CRAZY AS HELL is a type of horror that sneaks up on you and before you know it, it’s got you. Highly recommended. About the whole black guy dies first in the movies cliche, I always thought a smart script writer could write a movie where the monsters seems to kill the black guy first only for him to show up later alive and rescue the other characters from the monster. Not that will happen. They will keep making movies where the black guy always dies.